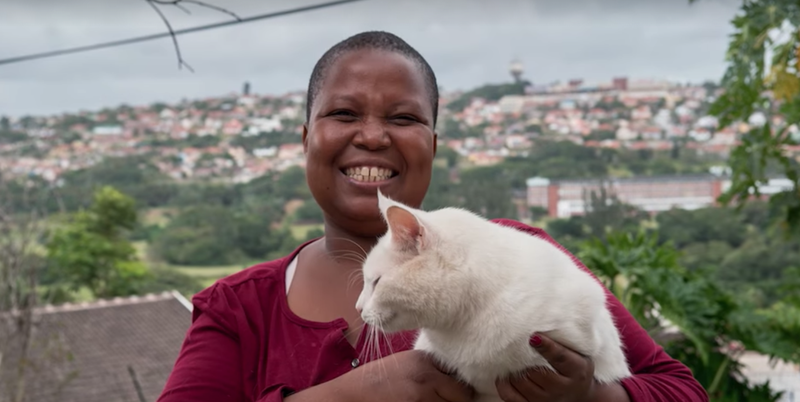 Second Chance is a free-roaming cat sanctuary in Durban founded by Dorothea Nkupane. Dorothea Nkupane / Beautiful News. A furry tail brushes past Dorothea Nkupane, followed by an expectant purr. Moments after she brings out a bowl of dry pellets, a calico cat leaps onto the kitchen counter. It’s feeding time and Cat Nanny, as Nkupane is known, has to see to the needs of the felines. All 55 of them. When they’re not eating or searching for a quiet spot to nap, the rescues roam the garden, free from the confines of a cage. Their past life of trauma is long forgotten as they bask in the sunshine, enjoying the cuddles, strokes, and attention Nkupane provides. Second Chance is a free-roaming sanctuary in Durban. Secure cat-proof fencing keeps the cats safely within the perimeter of the property, where Nkupane is able to watch over them and ensure they are given the care they need. “Many of the cats that come here have been mistreated,” she says. Abuse and neglect result in the need for urgent vet care and, in some cases, specialised treatment. Volunteers work together with Nkupane to ensure as many cats as possible can be healed and re-homed. But it’s not easy feeding, treating, and cleaning up after a full house of felines. “It’s important for more people to help because rescues always need donations,” Nkupane says. Part of caring for cats, both in the sanctuary and on the streets, involves changing the way people think about them. “Just because cats are independent doesn’t mean they don’t need love and attention,” Nkupane says. She knows every single one of those in her care by name. “They’re all my favourites,” she says.